Victoria Beckham tweeted this picture minutes before her Autumn Winter show at New York Fashion Week captioned "Meet Harper! X vb." The former spice girl has named the bag after her fourth child, baby Haper. 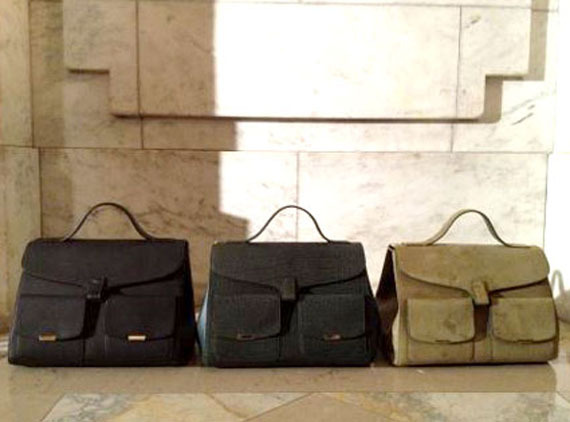 The bags are shown here in three winterly shades of suede complete with a top handle, front pockets and gold hardware. Victoria Beckham added handbags to her super successful ready-to-wear line in 2010. The bags have also done very well and the new Harper bag is already expected to be the next big thing when it hits the stores with the Autumn/Winter collections later this year. I see a lot of working girls carrying this. What do you think?